Discover our different workflows for DC subsets and find the one that fits your experimental needs. DCs are the sentinels of the immune system and are especially located at the interface between the body and external environment. Isolation of DCs from different tissues can be performed by using the combination of gentleMACS™ Octo Dissociator with Heaters, the appropriate tissue dissociation kit, and MACS® MicroBeads. Pan DCs can be isolated from dissociated tissues such as spleen, lung, or lamina propria using CD11c MicroBeads UltraPure. 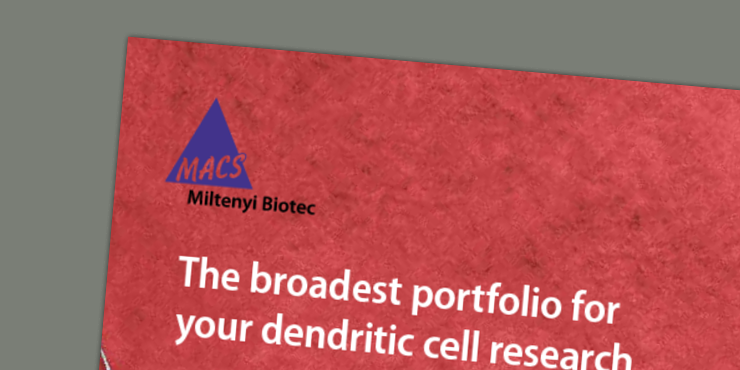 Enriched DCs show high viability and preserved epitopes enabling the detailed analysis of distinct subsets using MACS® antibodies. Enrichment and analysis of DC subsets from mouse tissues. (A) DC and macrophage phenotypes after dissociation o mouse spleens, lungs, and small intestines with gentleMACS Octo Dissociator with Heaters and the respective MACS Tissue Dissociation Kit. 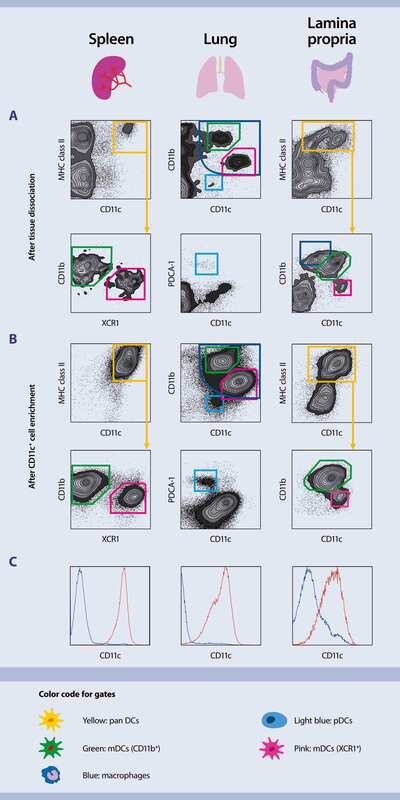 Dissociated cells were stained with the specified antibodies and analyzed by flow cytometry using Flowlogic software. Cells were gated on the PI– population. (B) Enrichment of pan DCs and CD11c+ macrophage populations with CD11c MicroBeads Ultrapure. Enriched cells were stained with the specified antibodies and analyzed by flow cytometry. Cells were gated on the PI– population. (C) Comparison of CD11c+ populations before (blue) and after (red) enrichment with CD11c MicroBeads UltraPure, mouse. Cells were gated on the PI– population. Watch how easy it is to manually separate DCs from mouse tissue using MACS Technology. Download this poster to find all DC surface markers and products you need for convenient isolation and analysis. Efficient loading of DCs with antigens is key for antigen presentation to T cells. By using PepTivator® Peptide Pools, antigen loading has never been easier. There are several ways a dendritic cell can be loaded with an antigen. Once option is to add into culture peptides that will be phagocyted and presented on MHC molecules. We offer a broad range of PepTivator peptide pools. This extensive panel of virus- or tumor-specific antigens consists of 15-mer peptides with 11-amino-acid overlaps, covering the complete sequence of the respective antigen. Culturing DCs together with PepTivators leads to peptide phagocytosis and presentation on MHC molecules. Characterization of DCs can be a challenging task. 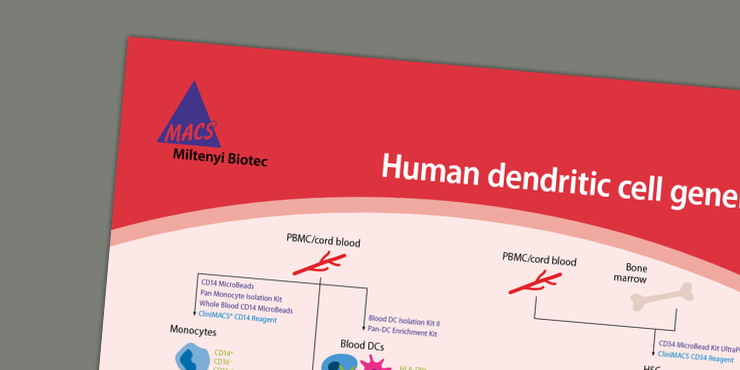 Using our REAfinity™ Recombinant Antibodies, flow cytometry analysis of human and mouse primary DC populations is easy and reproducible. Download the DC quick guide and browse through the broadest portfolio on DC generation, isolation, and analysis in the field.